16. Symbiosis: Why was the transition from microbial prokaryotes to eukaryotic organisms a cosmic gigayear event? 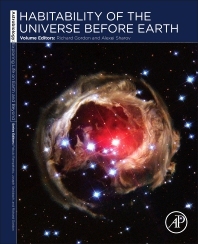 Habitability of the Universe before Earth: Astrobiology: Exploring Life on Earth and Beyond (series) examines the times and places—before life existed on Earth—that might have provided suitable environments for life to occur, addressing the question: Is life on Earth de novo, or derived from previous life? The universe changed considerably during the vast epoch between the Big Bang 13.8 billion years ago and the first evidence of life on Earth 4.3 billion years ago, providing significant time and space to contemplate where, when and under what circumstances life might have arisen. No other book covers this cosmic time period from the point of view of its potential for life. The series covers a broad range of topics encompassing laboratory and field research into the origins and evolution of life on Earth, life in extreme environments and the search for habitable environments in our solar system and beyond, including exoplanets, exomoons and astronomical biosignatures. Alexei Sharov started his career as an entomologist and ecologist, but soon realized that he had to answer more fundamental questions: what is life, how it evolves, learns, and functions. Thus he got involved in the Research Group on Theoretical Biology at Moscow State University, and started publishing theoretical papers. Later he organized a seminar and two conferences on Biosemiotics, which is a synthesis of biology and semiotics, a theory on signs and meanings. Since 2002, he has worked in molecular biology and bioinformatics, and this new field helped him to advance further in the area of theoretical biology and biosemiotics. He has published over 200 papers and edited a special issue.